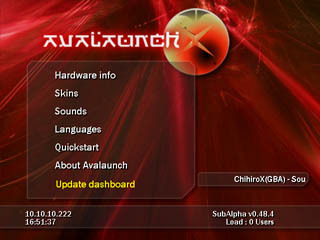 Avalaunch gives you a Quickstart menu for automatic booting to user-configurable games, programs, or even another dashboard. 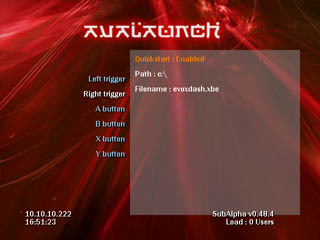 It also contains many Language files for the non-english, and the ability to update Avalaunch directly from the dash. No more hunting around the web! 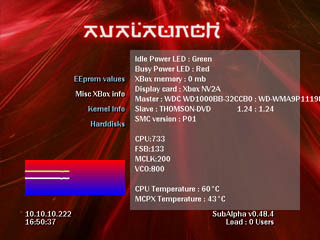 Avalaunch contains several submenu items that display everything about your xbox hardware and eeprom information. With Avalaunch, you can assign just about anything to be a startup item. Then, by holding down the assigned button while your xbox boots, you can do stuff like begin XBMP immediately, automatically start the last game you were playing, or anything you like! 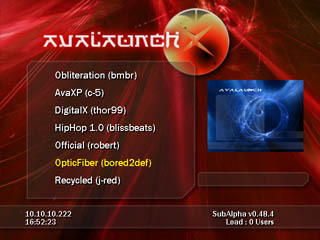 Avalaunch not only provides a thumbnailed preview of the skin on the right, it also allows you to download and install skins from websites like allxboxskins.com!